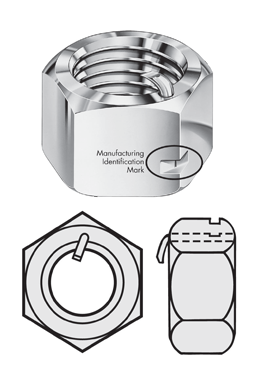 The ANCO® PN-LOC® is our proprietary, all metal, self-locking nut that features a stainless steel ratchet pin. Coupled with a unique controlled lock indention, this non-breakable ratchet pin limits damage to bolt threads, and the removal of galvanizing while ensuring consistent locking torque. This is the nut upon which we built our reputation. All metal self-locking nut with a stainless steel ratchet pin. Available in American Standard and Metric; Hex finished and heavy nuts. Limits the removal of galvanizing and damage to bolt threads.